The fact that so many quilts descended in the families of Catherine Garnhart's 11 grandchildren has led family, curators and historians to conclude that Anna Catherine Markey Garnhart made quilts in a signature style in Frederick, Maryland from about 1820 to 1850, the years when her grandchildren were born. 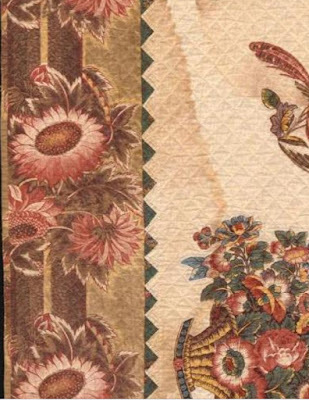 These exceptional bedcovers were handed down in her family for generations. 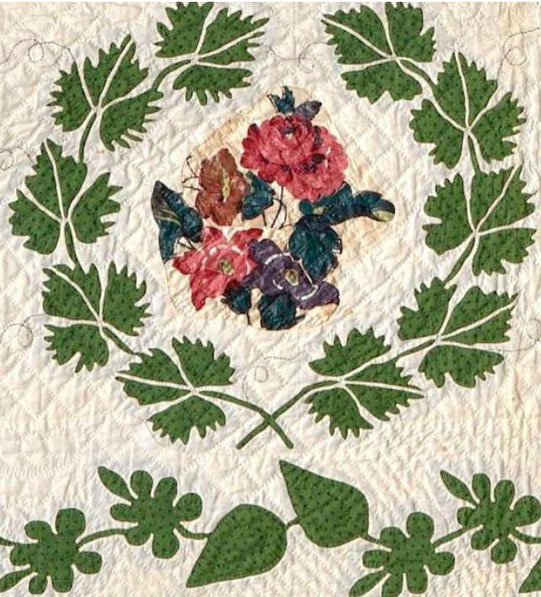 "Because of the regard held for these quilts it can now be documented that Anna Garnhart made a few outstanding quilts." 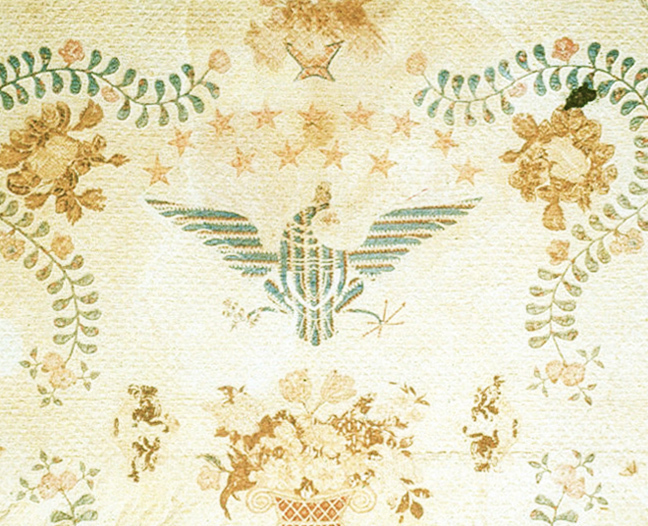 This quilt is quite a bit different from the others but it has the same elements and descended in the family of grandson John David Markey, (1822 -1898) through his descendant Geneva Isabelle Covey Drake of Fargo, Oklahoma. and an unusual decorative design. 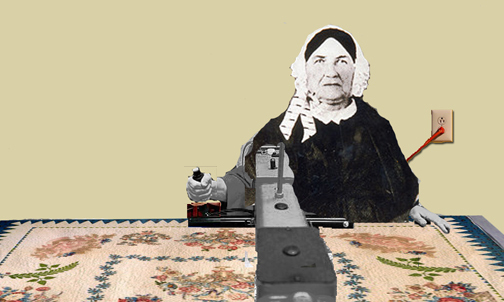 "This is Sherman's great-great-grandmother, the one that made the eagle quilt." No name. seen in the leaves in the center of #5. The donor thought it had been made for Catherine's grandson John David's birth in 1822 and then given to his daughter. A note preserved in Geneva's Covey family dated 1901 from Catherine's aunt Anna Catherine Markey Mantz Jones described it as being made about 80 years ago (1820). "Grandmother [Catherine] made it for [John David]...grandmother made us two girls one each." 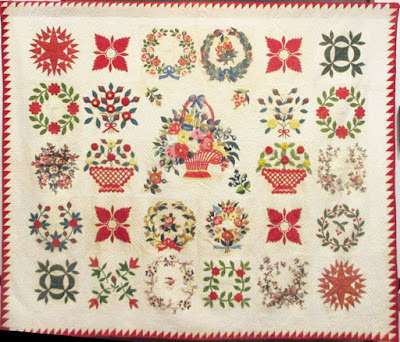 There really is nothing in the published note that indicates the quilt was given as a birth present, but somehow that story and that date has stuck with several of the quilts. We have seen that the fabrics likely date the quilts to a decade or two later than that time frame, perhaps 1835 to 1850. Every "fact" in a family story must be checked against records and we have seen that names are wrong and assumptions are misinterpretations. 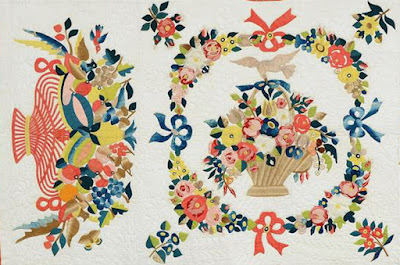 Women in the mid-20th-century Covey family may have made quilts for birth gifts for their children---why wouldn't Catherine have done the same 130 years earlier? The crib quilts in the Garnhart group may have been intended for newborns but it is more likely the larger quilts were given as wedding gifts, coming of age gifts, or just a gift to even out the score---every grandchild gets a quilt at some time. 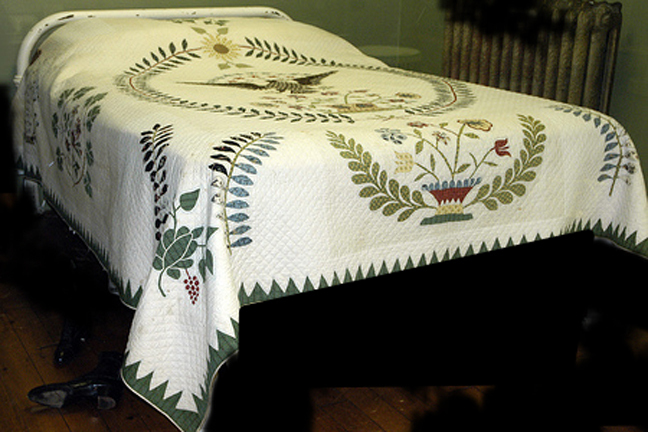 As Dorothy Cozart wrote: "It is not surprising that Catherine chose to make quilts. She had the leisure time and the money with which to buy the fabrics." So we need to examine the major assumption. 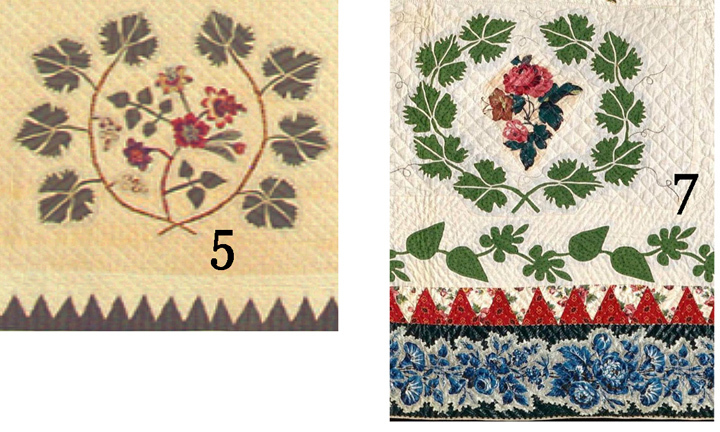 Could one woman have made 11 quilts (plus others like the one above) in those 15 years between 1835 and 1850? Catherine Garnhart in 1840 was about 67 years old, a widow comfortably fixed in a substantial home in a large town with a son and an elderly mother living closeby. According to the 1840 census, Catherine was head of the household and living alone. Only one female is listed in her home. Catherine had servants but apparently no slaves. She had eight surviving grandchildren, five by son David Markey II and his wife Susanna Bentz Markey and three by daughter-in-law Eliza Markey Thompson who was soon to be widowed for a second time. (Three more grandchildren by David were born in the 1840s.) She was born into a strong German culture and remained a German speaker all her life. 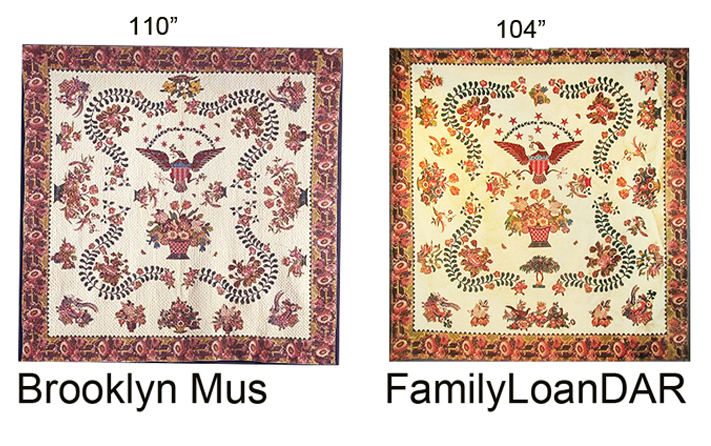 Assumptions about her quilts are many. 2) The quilts are distinctive and can be recognized by her style. 3) She was an extremely skillful seamstress as seen in the delicate and abundant reverse applique. Twins (?) 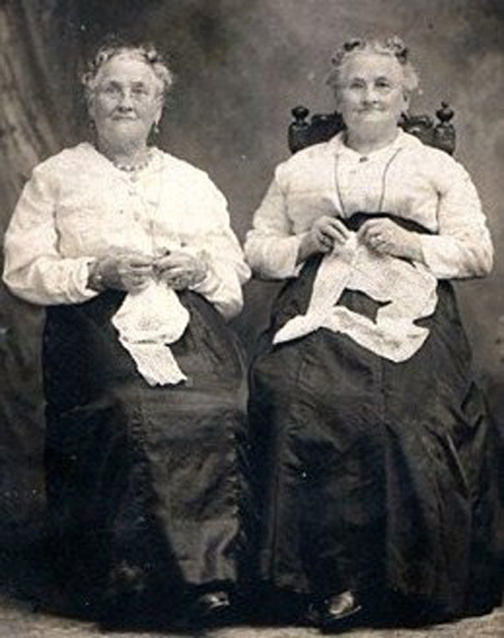 at their needlework, about 1900. 4) She spent a good deal of time at this occupation. 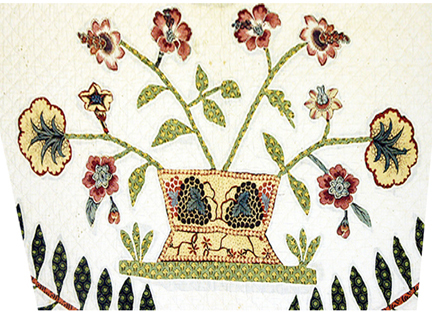 Turning out a minimum of about one quilt a year for 15 years would require countless hours with a needle in her hand appliqueing---to say nothing of time devoted to shopping for fabric, cutting small images from furniture chintzes, assembling various-sized blocks into a top, framing them with multiple borders and quilting several. 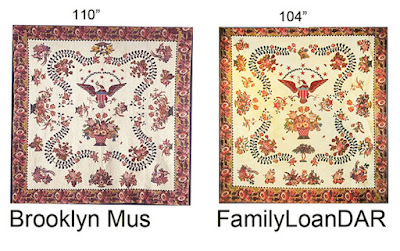 Once marketed as a "Mary Evans quilt"
Does this sound familiar? A woman living about 50 miles away in Baltimore at the same time once received the kind of credit that Catherine Garnhart has. If you have been looking at antique quilts for a while you may recall when Baltimore album quilts were assigned to a single creator. 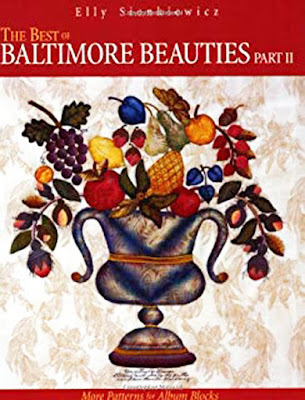 Mary Evans was considered the Rembrandt of the genre of high-style Baltimore Album quilts. You may also recall when Elly Sienkiewicz gave a paper at the American Quilt Study Group's 1989 seminar. "The Marketing of Mary Evans” argued against the one-woman/one-style concept in several ways. Elly's personal experience in re-making historical blocks requiring 50 hours for each was one thread of evidence. 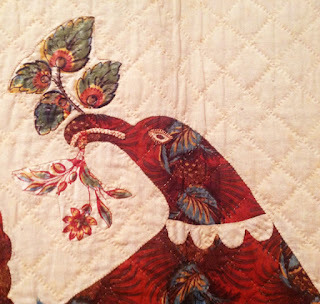 She asked a friend to count her hours in making an elaborate applique finding a professional seamstress needs a year or more of forty-hour weeks to make one classic 104" square quilt No one person could have made the dozens and dozens (hundreds) of Baltimore album quilts. 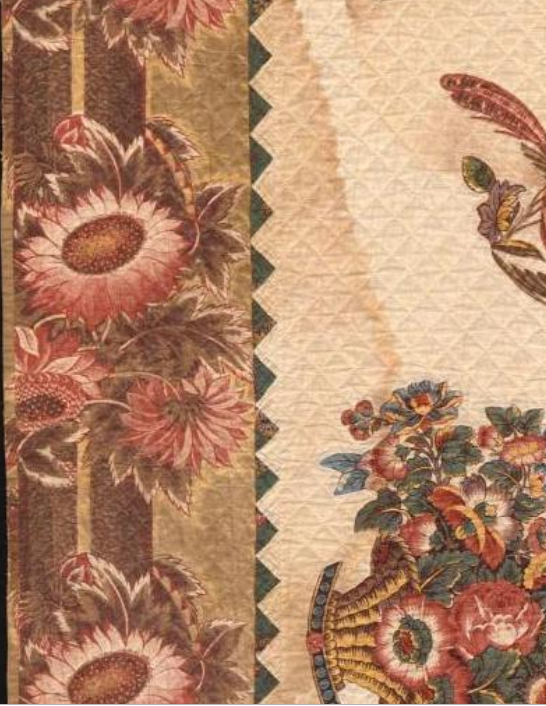 "It is very unlikely that one woman could have made the huge number of high-style blocks that are known all with hundreds of pattern pieces to be pinned, cut out correctly, positioned to overlap other pieces and basted in place in set schemes." If Mary Evans did not sew the similar blocks who did? The theory today is that similar blocks were sold by several designers and/or seamstresses as basted kits, finished blocks and patterns---a school of Rembrandt, perhaps. Cooney and McAllen identify others associated with the quilts, among them Mary Simon, Maria Bond Wehner Williams, Elizabeth McKenney Sliver, Mary Chase and various milliners and proprietors of fancy goods shops. 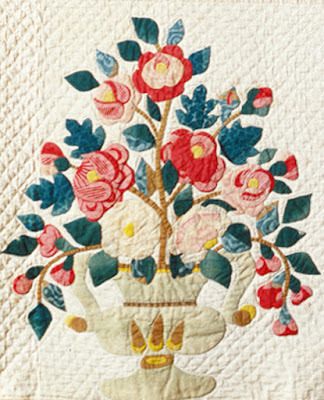 Hobbyists could have appliqued the pre-basted blocks themselves or purchased a finished block for a gift or their own quilt. 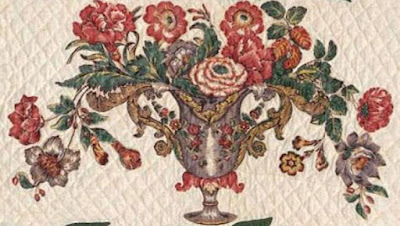 The Garnhart group attributed to Frederick, fifty miles from Baltimore, includes far fewer quilts than the Baltimore album group that Debby Cooney estimates as 400. But parallels between the Garnhart family quilts and the BAQs are too strong to continue to assume that one woman designed and stitched the quilts. There has to be another logical origin story. 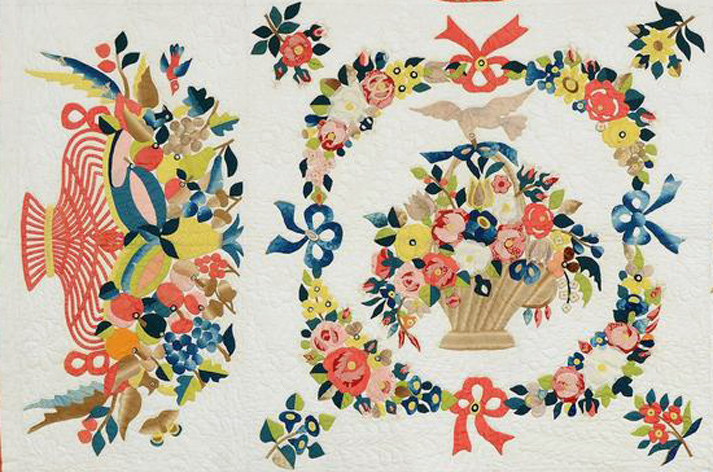 Was Catherine Garnhart a very good quiltmaker or a very good customer? *The younger David Jacob Markey was considered mentally ill and erratic. He was berating his boss ferry Captain George Leonard who hit him in the face. Markey fell down, hit his head and did not get up again. Leonard said he thought he was just drunk, so made his scheduled ferry trip. When he returned he was surprised to find himself arrested for murder. He served three years before his sentence was commuted by the Governor. David Jacob Markey was mentioned as coming from a nice family and indeed he did. I'm finding your research here very interesting. It is very difficult, this much later, to find out the info you are searching for. I commend you on doing this, searching for answers.